Prime Minister Narendra Modi’s sudden visit to Wuhan for a two-day ‘informal dialogue ’ with Chinese President Xi Jinping earlier this week revives questions in India about whether the mutual sincerity expressed by the two leaders could be transformed into something greater: a shared commitment to a new order, the ‘Asian Century’. While the appointment of senior diplomat Vijay Keshav Gokhale  as the new foreign secretary in January marked the beginning of New Delhi’s attitudinal shift, the realisation that the relationship may be changing seems to have seeped into India’s entire political spectrum. In an unusually short span of two months, beginning with the new foreign secretary’s visit to Beijing  in February, India’s National Security Advisor , Defence Minister  and External Affairs Minister  have all visited China, demonstrating New Delhi’s commitment to constructive engagement. While the existence of diversified channels of communications, bilateral dialogues and confidence-building measures have been instrumental in managing Sino–Indian ties, New Delhi’s latest outreach marks a systemic shift in these mechanisms’ orientation. Rather than managing the relationship in a perceived zero-sum setting, the new approach envisions deepening interdependence. Visits to China by previous Prime Ministers Rajiv Gandhi, Atal Bihari Vajpayee and Manmoham Singh generated high expectations and ice-breaking agreements, but fell into the structural trap of managing bilateral irritants. In this context, Wuhan’s informal setting aimed to ‘reset ties ’ without allowing complexities considered systemic to Sino–Indian ties to short-circuit discussions. Optimism runs high because the potential benefits of cooperating also appear to be high. On a global scale, as leading economies and regional military powers India and China are insulated from external threats such as those faced by the United States or Russia. That relative freedom reinvigorates the idea of combining their efforts to shift the weight of global multipolarity in Asia’s favour. As the unfolding conflict in the Middle East  creates increasing tension between the US and Russia, and where the political discourse signals the return of hard-power disputes, there’s huge potential that India and China could redefine their bilateral relations, as well as the relations of blocs such the G-20, BRICS and even the Shanghai Cooperation Organisation. Those organisations—besides catering to the needs of the developing world—could potentially defuse crises erupting in regional theatres as a result of Cold War–style ructions. On the economic front, deeper and equitable ties with India could at least partly insulate China from the threat posed by America’s unpredictable economic policies , a potential that up to now has been left underexplored deliberately. The larger idea driving the summit was that rather than allowing existing rivalries to spiral into regional competition, New Delhi and Beijing could combine their mutual economic and geostrategic power to project greater influence in shaping the global security and geoeconomic architecture at a time when the relative decline of the US has provided greater manoeuvring space. In the region as well, the summit came as a welcome break from the usual issues driving the two nations’ foreign policymaking, where their unsettled border, Sino–Pakistani ties and the Dalai Lama take precedence. The institutionalisation of those tensions even manifest themselves in global fora, such as India’s quest for membership in the Nuclear Suppliers Group and the issue of Masood Azhar in the Security Council. It should be recalled that the first Sino–Indian strategic dialogue, held in February 2107, was a non-starter precisely because the Indian side focused on those irritants . As experience from the older approaches gives way, and as newer avenues of cooperation throw up new ideas while still allowing negotiations about the old irritants to follow their course, the way that the Sino–Indian relationship is understood and conducted could be revolutionised. This has become clearer as Modi called for more informal summits , giving precedence to personal diplomacy intended to bypass these old structural trappings. 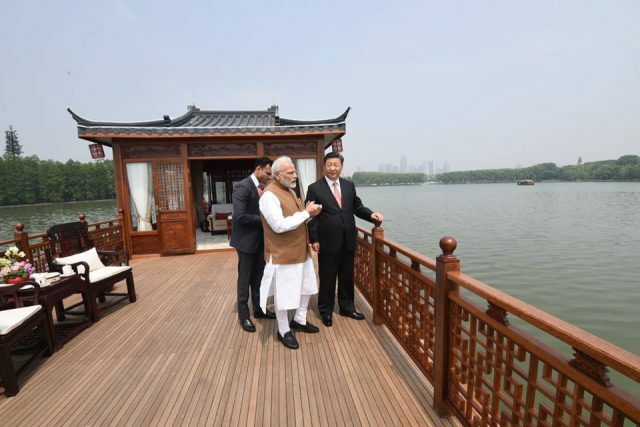 Modi’s call to engage with President Xi on ‘issues of bilateral and global importance ’ set the template for this dialogue, and emerging details  have outlined the course on how both those bilateral and global issues would be dealt with. For example, the two leaders agreed that the old, ongoing irritants can be managed through existing mechanisms, but avoided getting into specifics. That marked a shift from the older approach. In a breakthrough announcement, both agreed to a joint economic project  in Afghanistan, marking a diplomatic achievement for India in the context of the two countries’ relations with Pakistan. As expected, the leaders discussed evolving global challenges, emphasising avenues of strategic and economic cooperation. The fact that they discussed efforts to overhaul international institutions—aiming for ‘open, multipolar pluralist participatory global economic order ’—goes a long way to explaining how discussions escaped falling hostage to the old irritants. That said, even if the summit ended on a high note with the acknowledgment of the benefits that lay ahead, some critical issues seem to have been temporarily forgotten in the warm glow of optimism. It isn’t yet clear, for example, how the two nations would recalibrate their geostrategic objectives to align with the new consensus. To begin, how will the pledged ‘new era’ of cooperation accommodate India’s opposition to China’s Belt and Road Initiative (BRI), particularly given that New Delhi recently reaffirmed its refusal to participate  in the BRI. Second, as Chinese policies in the South China Sea are the focal point for the Quadrilateral Security Dialogue’s (Quad) revival, Indian participation in the Quad will require a tightrope walk by New Delhi, unless the very idea behind Quad 2.0 undergoes a change. Third, with bilateral economic ties strained after India’s trade deficit with China crossed the $50 billion threshold , how the two nations envision reshaping the global economic order remains to be answered. In other words, having identified the path of cooperation, success depends on the strategic overhauls that lie ahead. Prateek Joshi is a research associate with Vivekananda International Foundation, a New Delhi–based public policy think tank. Image courtesy Narendra Modi via Facebook.